Video with short tutorial for the base of the mini album pages. The tutorial on how to make the base of the mini album starts at 13.45 minutes in the video. When the box opens there is a fairy tale garden inside the lid with a expandable pocket to hold pockets and other things. Tree dies from Memory Box. A mini album fastened on the bottom. Have formed the pages round a roll to make them stand up a bit. Seen from the side. Used seam binding to hold the lid. Scenes from the fairy tale garden. Key hole and keys also from Graphic 45. Left side . Fence die from LaLa Land Crafts and grass die from Memory box. Have backet them all on cream cardstock to make them more durable. Here you can see how the pages bend up. Some of the images are glued to the pages and some on tags that sticks under on the sides of the pages. All the tags taken out of the pages. There can be plased photos on or on the backside of the cut aparts. 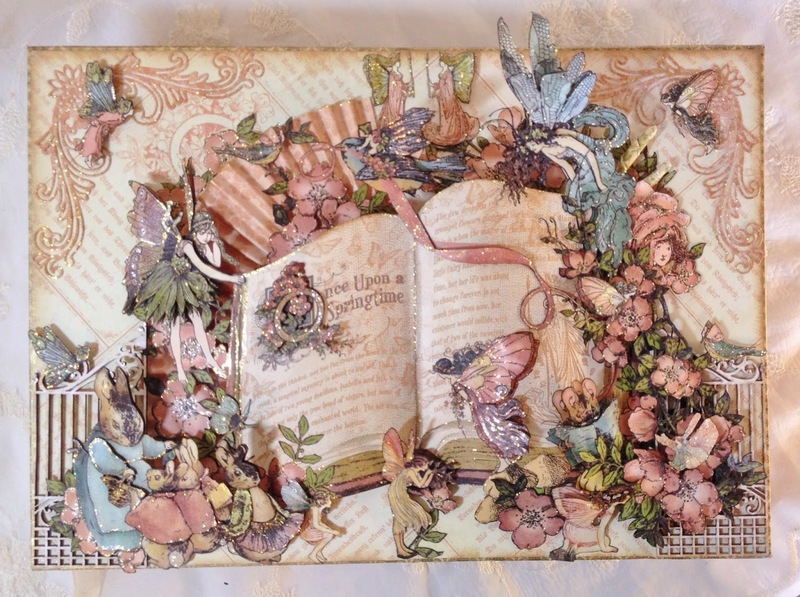 Under the pages on each side there are more fairies and a photo frame. Made a support onder on the backside so the box can be displayed in an angle. Here you can see the folded in under the box. It is fastened with magnets. Made the banner with a Stampin up punch. Templates and measurements for the box. You create the most amazing things! Thanks for inspiring us with your beautiful projects! Your album is absolutely fantastic,unbelievable. Thanks for all inspiring videos. Anne, it is something outstandind, a real piece of art! Great work ! I admire your imagination!!!!!!!!! It's really fantastic, gorgeous, fabulous, I think there does not exist enough words for such a master piece, it has always been my favorite collection of graphic paper, chapeau!!! and many thanks for this wonderful inspiration!!! Anne, this is extraordinary! Truly beautiful! This is so beautiful! You are a master! I love this collection and you have used it to perfection! Wishing you a happy day! Anne this is stunning, a beautiful present for any little girl ,I love your projects ,it is awesome. Thanks for sharing and have a Happy Easter. Очень понравился Штучной упаковке мини-альбом с графическим 45 раз на весну! Не смогли бы Вы показать бумагу графика45 из которой он сделан полистно? Очень хочется посмотреть бумагу. Хочется попробовать сделать эту красоту. OMG. I see it and I still don't believe it...absolutely beautiful!!!!!!!!!!!! ART!!!! WOW... this is just spectacular! I honestly don't know how you have all that patience to fussy cut each little item out, but man, your projects are speechless!!!! This is just brilliant and gorgeous Anne! I really enjoyed the fussy cutting tutorial. I never thought of using the multi matte to stiffen the cut outs! Thanks so much. Anne, you are amazing! I love your art. You and Graphic 45 are the best. I think my little granddaughter would love this. Adesso vorrei realizzare per me questa scatola ( sto già tagliando tutte le figure che sono riuscita a individuare ) per mettere le foto delle mie nipotine che sono le mie fate :) ... volevo farti una domanda : come hai fatto e con che cosa hai glitterato le figure ? Замечательна работа! Очень красиво, нежно, необычно, сказочно! Хочется эту работу брать в руки и трогать! Спасибо!